Step 2 - Understanding Eclipse Camera Exposure Based On Filtered Full Disk Sun Images. When analyzing the images from my two land based eclipse trips in 2001 and 2002, I came to a realization about understanding exposure. Back then I was using ISO 200 speed slide film. Photography is interesting because proper "exposure" of an image is based on three variables, f-stop, ISO and shutter speed. You can get the same proper "exposure" with various combinations of those three (slide 1). It was a little easier in the old film days because the ISO's were stepped and the shutter speeds were stepped and the inter-relationship between changing either of them one single step was changing "one stop" of exposure. It is a bit more complicated now with "in-between" ISO's and shutter speeds in digital SLR cameras. But my main point is that in solar eclipse photography, your f-stop is going to fixed, and you will choose what ISO (electronically) you are going to use, so that is fixed. So the only variable remaining is shutter speed. Eclipse photography is simple (basically) because it is limited to varying your shutter speed. The hard thing is finding the proper "exposure" because there is no good way to practice for a total eclipse in advance. 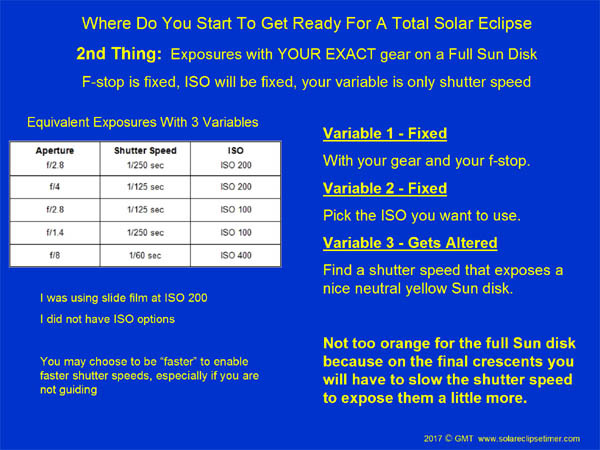 So in Step 2 I like to emphasize testing you gear on a full Sun disk image and obtaining the proper exposure of that, because this is away of learning a starting point of exposure for YOUR gear. Now, what I am going to say in this section works for the light transmission characteristics of Thousand Oaks Type 2+ glass filters and Thousand Oaks Optical Solarlite film filters (I plan to do some testing with baader filters and try to correlate it). Here is the key point: I have found that a properly exposed full Sun disk image, through one of those filters above, will also give you an idea of what your exposure is going to be for Inner Corona. Analyzing my images, when I was taking a full Sun disk image at 1/60 second with the glass filter ON, with the glass filter OFF during totality, that 1/60 of a second exposed the inner corona properly. 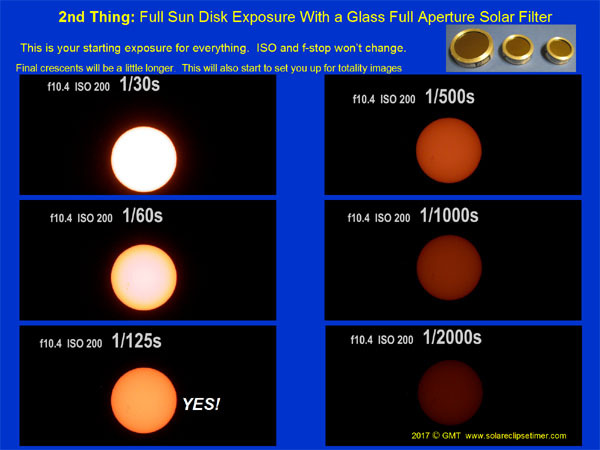 So all three of the photographic variables did not change, f-stop, ISO and shutter speed are the same, the only thing that changed was removing the glass solar filter. 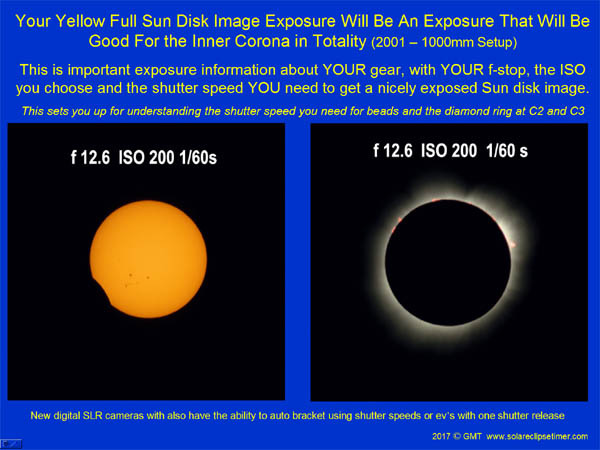 So the amount of light going through my lens with a glass filter and hitting my film for a properly exposed full Sun disk image is the same amount of light for the exposure for the Inner Corona with the light that gets emitted during totality (Slide 3). This is powerful information about YOUR setup! I believe this reveals much more exposure information about your gear than taking images at various phases of the Moon. The different phases of the Moon add a brightness variable that is hard to relate to eclipse photography. It is written that the amount of light emitted from the Moon during its quarter phase, to its half phase, is about the amount of light you have to expose the corona. So with YOUR gear and a Thousand Oaks Type 2+ glass filter or Solarlite filter, right now, you can know your Inner Corona exposure. Your gear has a fixed f-stop. Pick your ISO, you can be a little slower if you are using a clock drive, be a little faster if you are just using a camera tripod. These two variables are now fixed. The third variable is choosing a shutter speed that exposes a nice yellow Sun disk image.